The roof over your family’s head is the most important structural component of your home! Roofs protect your home from all that crazy Midwest weather. Roof replacement average a 69% return on investment when selling your home! Building materials and installation techniques of those materials are continually improving increasing roof life, appearance, performance, and energy savings. Let’s face it. A properly installed quality roof makes your house look great! A properly installed roof with adequate ventilation will improve energy bills and give your air conditioner and heating system the break it needs. You notice water leaking from your ceiling. Water damage claims are the second most frequent of homeowner’s insurance claims behind wind and hail damage.Roof leakage can beVERYcostly, so it is important to have your roof inspected regularly. Leaking roofs will eventually cause damage to your ceiling and attic, damage your attic insulation, breed unwanted bacteria, rot out your roof deck, and deteriorate your trusses. Your roof is beginning to deteriorate. Think wear and tear, that is roof deterioration. An easy way to spot this is to look in your gutters for shingle granules. A few is normal, but if you notice more, it means your roof is getting close to the end of its life. Roof deterioration may be more pronounced in some spots of your roof than others making it difficult to spot from the ground. This falls under “gradual damage” in your homeowner’s policy and navigating these waters can be tricky. It is important to have your roof inspected regularly be licensed contractors to spot a potential leak and avoid more severe water damage costs. You notice buckling or curling shingles, bald spots, or cracked shingles. If you notice any of these issues on your roof, call a licensed contractor to have your roof inspected. These issues are usually caused by severe weather damage and your insurance company may be required to cover the costs of replacement. Your heating and cooling costs are higher than they should be. Ventilation is the mother of all roof issues and problems. Inadequate ventilation causes premature aging of your roof system, trapped moisture in your attic space causing mold, ice dams, higher energy bills, and voids your warranty. All of which can be prevented by a quality, licensed roofing contractor! There are specific formulas for proper roof ventilation that MUST be followed to prevent ventilation problems. Proper adherence will result in lower energy bills, a solid warranty, and a roof that lasts. You notice ice dams on your roof. Ice dams are rampant in the Midwest due to poor installation practices from contractors. Ice dams are patches of ice, usually appearing along the eaves of your home, that crawl up underneath your shingles through freeze/that cycles and damage your roofing system. Ice dams can be almost completely prevented by proper ventilation and properly installed ice and water protection. Your roof is over 20 years old. If your roof is over 20 years old, chances are you need the roof replaced before it begins to leak. Roofs tend to last fewer years in the Midwest due to drastic temperature changes resulting in many freeze/thaw cycles. New roofing material technology has advanced to provide greater protection for your property for longer life cycles. You notice moss, mildew, or mold on your roof system or inside your home. If you notice moss build up on your roof system, there is moisture getting trapped in those areas. You may brush the moss away with a thick brush, but the moss will return, you may scrape off shingle granules deteriorating the shingles, and it does not fix the moisture problem in your roof system. Call a licensed contractor and have him inspect your roof. If you notice any mold or mildew, call a licensed contractor immediately. CertainTeed DiamondDeck®synthetic underlayment is used on all projects. CertainTeed starter shingles are used along all eaves and rakes. WinterGuard®, or “ice and water barrier/shield,” is installed according to national and local building codes. Lauts Exteriors installs WinterGuard® along all eaves, overhanging rakes, all roof penetrations, and valleys. All roofing systems Lauts Exteriors provides will have a minimum warranty of 25 years. 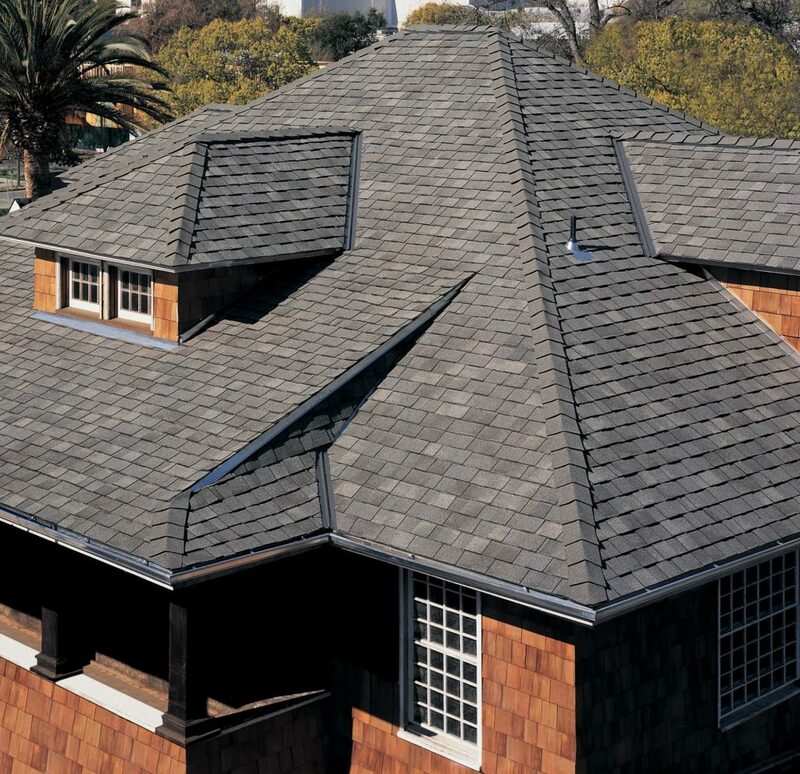 CertainTeed hip and ridge cap shingles are used on every project. CertainTeed flat roofing materials are installed on all projects requiring low-slope roofing materials. Roofing system ventilation is installed according to applicable model code requirements and/or local building codes, whichever provides greater protection. CertainTeed ridge vents and intake ventsare installed on all projects. All crew members are trained according to the CertainTeed Shingle Applicator’s Manual on proper installation procedures. These techniques are followed religiously by all crew members on every jobsite. Relax and know your home is protected with a high-quality roof that’s installed right and looks great! If you have absolutely any issues, concerns, or questions, contact us immediately. We take our reputationwith the community VERY seriously, please let us fix it. Tarps will be placed around the base of your home to collect nails and debris. Tarps may be hanging on your home in area we feel your siding or windows are at risk of being damaged. Plywood may be placed over windows, landscaping, or bushes if we feel they are at risk of being damaged from debris. Our crew will tear off the existing roof system exposing your roof deck. If weather permits the crew will tear off the whole home, if not, they will do one side at a time to ensure your property is protected. Your roof will be cleaned thoroughly and inspected for any roof deck damage. Your roof will be covered with WinterGuard® and DiamondDeck® underlayment according to national and local building codes, whichever provides the most protection. Drip edge will also be installed during this phase. Starting courses are laid, and shingles and flashingare installed. Your roof is ventilated in adherence withstandard roofing ventilation formulas. All building materials installed during this process are in adherence with national and local building codes. Your roof system is given a final inspection.